The Northpole Hotel & Rentals sponsored- Babasiga Lions defied all odds to remain unbeaten in the first tournament of the Fiji FA calendar. 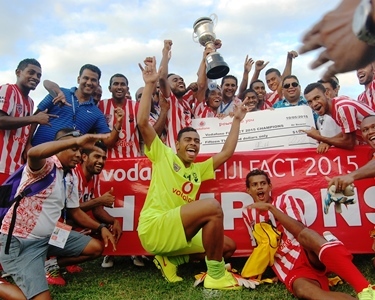 They beat Rewa 2-0 in a thrilling final last Sunday at Prince Charles Park, Nadi. The victory has become sweeter as this is their first tournament win on western soil and also their fourth Fiji FACT title victory. Labasa Football Association president Rayaz Ali said they would definitely celebrate the victory in a big way and honour their heroes. “We are planning to have the celebration this Saturday and I’m urging all the people of Vanua Levu to join us. This is my first title as the president of Labasa Football and I’m very proud of this and will do my utmost best to make this celebration a big one. We have won our first title on Western soil so this win is very special to us. Ali said the prizemoney would definitely be shared amongst the players and a lot of other incentives and presents will be added to it. The celebration starts with a march through town right to Subrail Park where the players and officials will be acknowledged and rewarded for their achievements in the tournament. Goals from Ravinesh Karan Singh and Taione Kerevanua in the final saw the Lions walk away with the $15, 000 prizemoney.